Pheromones are biologically active substances secreted from the body of animals that elicits physiological and behavioral changes in another individual of the same species. Pheromones are ectohormones released from the body to exert influence on another animal of the same species. The word Pheromone is derived from two Greek words Pheran which means to transfer and Horman to excite. Humans, like other animals also release pheromones from the body, but its quantity is less significant since it has no relevance in communication. 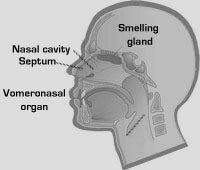 Human pheromones do not have to be consciously perceived to affect the recipient, but have been shown to affect our behavior when used at subconscious levels.